Évora is a city and a municipality in the district of Évora, in the Alentejo region of South Portugal.It is an historic/momumental city. By train (distance: 130 km). There are 4 trains to Évora daily (3 trains on weekends). The trip takes 1h20, cost about 12 euros, and it's a very comfortable train. The Évora train station is located close to the city center (around 10 min walking). You can check the timetable of trains in the official website of Comboios de Portugal . One of the nicer ways to see the city is by horse carriage ride. You can find them near the Cathedral. All the monuments are really close to each other, so there's no real problem in walking between most of the main sights. 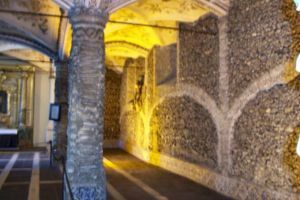 While there are some Roman ruins that you definitely need to check out, there is also the Capela dos Ossos (Bone Chapel), ornamented with real human bones. Contrarily to what is sometimes said, it is not unique. The old aqueduct with houses built into the arches is interesting. It is completely dissimilar from the superbly structured one at Elvas, except that both seem far too much work for the trickle of water they carried. You must visit the Almendres Cromlech megalithic complex, an important megalithic monument in the Iberian Peninsula. It is the largest existing group of structured menhirs in the Iberian Peninsula, and one of the largest in Europe. 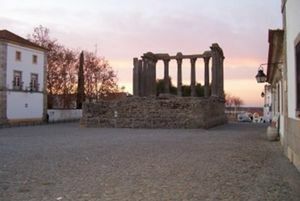 It's situated about 10 km from Évora, going by Guadalupe. Continuing this trip, near Valverde, the Anta do Zambujeiro dolmen, also very unusual by its size. In less than an hour, you can get by car to Monsaraz (exit via IP2 to Beja, then turn to Reguengos), a nice, well preserved walled town on top of a hill overlooking the Alqueva Dam waters. There's plenty where to sleep (cheap Bed and Breakfast and Turismo de Habitação, and an Inn) and where to eat. Around it are a couple important menhirs, one of them with engravings (Balhoa) and the other about 5 meters high, and a anta (passage dolmen). The Xares cromlech is a conjectural reconstruction, and was removed from its original place due to the Alqueva waters. There is a nice and big park (Jardim Público) where you can have a nice stroll. 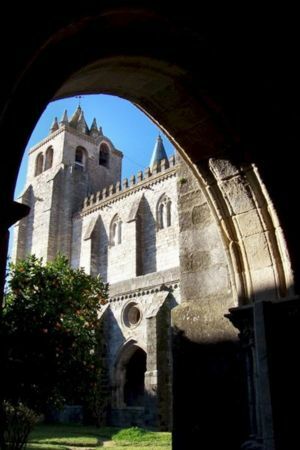 Historic Centre of Évora - UNESCO World Heritage . Eat and drink local and regional products. Shops are open a little later than other places in Europe, usually around 9:30AM-19.30PM, and the lunch breaks can be quite long, usually from 1PM to 3PM. Rua 5 de Outubro: From Praça do Giraldo to Sé. It's a pedestrian street with several small shops where you can buy souvenirs and clothes. The most typical souvenirs are honey, olives, all kind of object made by cork, home made jams, slippers made by sheep wool, etc. Rua João de Deus: a number of independent shops and services and well as known brands such as Pull and Bear, Pepe Jeans, Kids' Class, etc. 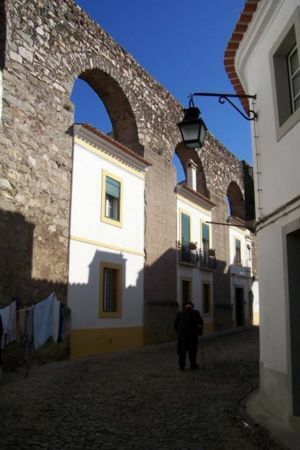 There are no malls in Évora. Farmers' market, praça 1º de Maio (close to the public garden). 6AM-13PM Saturday. An out door market offering the freshest fruits and vegetables from the local farmers. Food market, praça 1º de Maio (inside the building in the middle of the square). Every day in the morning. You can find fresh fish, vegetables, fruits, cheeses, hams, flowers, bread, meat, and other local food. Drink and carry plenty of water especially in the hotter months (July and August, eventually September). Especially in August, you will be advised not to go out in the sun between 2 pm and 4 pm, unless you are used to it. Remember that just going in for a drink is a perfectly acceptable way of getting in to see the public areas of a Pousada. Alentejo wines are some of the best-loved in Portugal, and there's a variety of them. Some can be quite expensive. There are several hotels and you can get directions in the Tourist Office, which is located in the main city square - Praça do Geraldo. There's a multitude of Bed And Breakfasts, though most will be fully booked during the high season. This page was last edited on 23 June 2017, at 14:48.